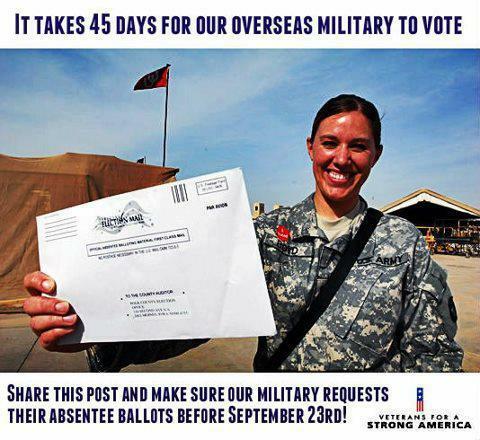 Did you know that deployed it takes about 45 days for deployed military personnel and military & families stationed overseas to register to vote absentee, receive their ballot and mail it back in? That means that they have until September 23rd to request their absentee ballot. If they register after September 23rd the deployed solider very likely will not receive an absentee ballot to vote in the November 6th general election. These are the people that are fighting every day for the American people. Defending our rights of freedom, choice, and opinion. It only seems right that we do our part to ensure they get the right to vote. Deployed personnel must fill out the Federal Post Card Application Form (SF-76) and should contact their installation voting assistance officer for more information. To get contact information for the nearest voting officer, please visit the Federal Voting Assistance Program’s contact information tool at http://www.fvap.gov/contact/ivaoffice/index.html. If you are stationed away from your place of registration, or to get further assistance in obtaining an absentee ballot for military personnel or overseas US citizens, please visit the Federal Voting Assistance Program online at http://www.fvap.gov/. If you are currently deployed, have a friend or family member that is deployed, or know of someone with connections to active duty personnel, please make them aware of this deadline and encourage them to get a ballot. Let's ensure that our service-members, who fight for our democratic process, are able to vote in this important election. It seems there are quite a few different deadlines out there but regardless, if you are going to request an absentee ballot don't delay. Do it today! I usually do not write when I am angry but this was wrong. Our nation was supporting the survivors of 9/11, victims of 9/11, first responders and the military community that has fought for 11 years since the attacks in 2001. This was not a political issue, it was a national issue and every media except the Today Show on NBC observed the moment of silence from the White House to Ground Zero New York and locations around the world. What program director made that decision? While it will not affect my choice of TV programs because I generally do not watch NBC, it left a real bad taste in my mouth for future choices. Are their advertisers seeking other venues? There is even a twitter hashtag - #NBCFail that is from former programming failures (Olympics) but has been revitalized as Americans respond to this negligence on NBC's part. How do you feel? 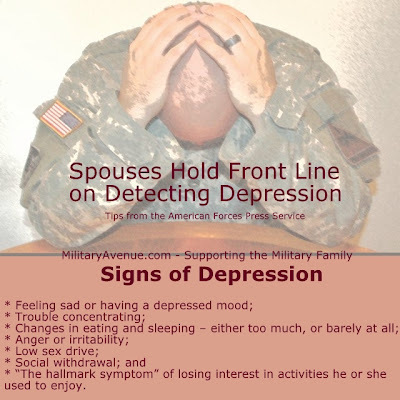 Does this lack of support from a major network reflect other issues that impact the morale of the troops, their families and wounded warriors? I think it does but trying to not be reactive but more like amazed. From Kindergarten through High School, homework is a recurring theme through the school year, usually met with loud, obnoxious groans from around the world. 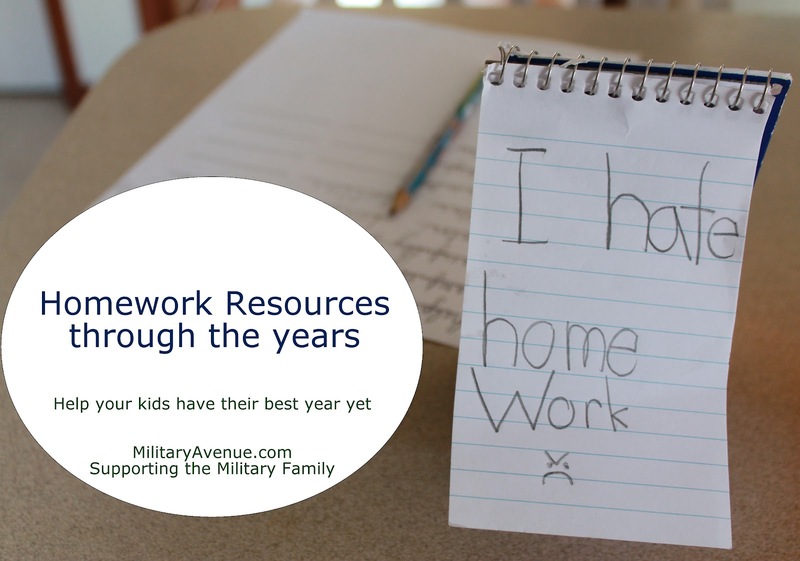 If you struggle, like I do, with motivating, encouraging and helping your kids to 'get the job done' here are some great resources. An exciting program is launching today, The Home Depot Foundation and The Home Depot store associates are deploying a two-month community outreach initiative, Celebration of Service to transform the homes and lives of veterans across the country. From September 6 to Veterans Day in November, store associate volunteers will complete hundreds of service projects – from making mobility modifications to the homes of injured veterans to renovating shelters for homeless veterans. Volunteer projects also will include energy efficient upgrades to homes of individual veterans and facilities that serve them to help reduce utility bills. Over the next four months, the MilitaryAvenue.com team will be partnering with The Home Depot as a part of The Home Depot Celebration of Service Blog Network! As part of this network, we will be talking about the challenges veterans face in our communities, participating in local service projects and events and exploring the steps that we can all take to reduce our home operating costs. Since its formation in 2002, The Home Depot Foundation has granted more than $300 million to nonprofit organizations improving homes and lives in local communities. This year an additional $50 million has been pledged! Stay tuned for more information and exciting projects coming up! Disclosure: The Home Depot partnered with bloggers such as me for their Celebration of Service Blog Network. As part of this program, I received compensation for my time. They did not tell me what to purchase or what to say about any product mentioned in these posts. The Home Depot believes that consumers and bloggers are free to form their own opinions and share them in their own words. The Home Depot’s policies align with WOMMA Ethics Code, FTC guidelines and social media engagement recommendations.